It is known that work breaks can play a big role in boosting morale and productivity. Rather than the morning coffee or cuppa causing a drain on working time, there is evidence to show that businesses can generate better results and become more profitable when their workers take regular, high quality breaks, particularly together. Research has found there is a rise in productivity from teams who take regular breaks as a unit. Researchers concluded that rather than individual skills or experience generating the most success, teams who got to know each other and learned to communicate well, away from a meeting environment, achieved the best results. Added to the morale boosting benefits of making the office a more welcoming, comfortable place for people to spend time, especially in the colder winter months when we’re often battling the elements to get to work, good quality catering should be an essential for employers. Here are five ways to make the most of workplace breaks in 2017. A comfortable break out area will create the ideal environment for people to recharge and meet colleagues. Sofa seating and bistro style tables and chairs will help to create a social space that employees want to spend time in and can use for brainstorming and informal, productive meetings. Premium coffee has become big news in the workplace since the arrival of coffee bars in high streets and our growing expectation that coffee should taste the same as it does at home and when we’re out and about. For anyone who likes the taste of premium coffee, but needs to make it quickly, pods are the answer. Capsule machines are easy to use and create virtually no mess. Single serve K-Cup™ pods by Keurig include a selection of coffee, chocolate and tea pods for use with Keurig Coffee Machines, ranging from the light roast of Green Mountain Coffee and refreshing Twinings™ English Breakfast Tea to the darker roasts of Barista Prima Coffee and Starbucks™ Caffe Verona. Premium instant ranges are ideal for use in offices and public spaces. Brands such as Millicano and Azera are popular choices with their taste and flavour. Millicano blends traditional instant coffee with finely milled real coffee beans for an authentic coffee taste, supplied in a 500g tin with approximately 275 servings. The Nescafé Azera range consists of Americano, Latte and Cappuccino to give the humble cup of coffee the full barista treatment. A New Year, new start is one motivation to choose healthier drinks at work, but office workers are also turning to fruit and herbal teas all year round. 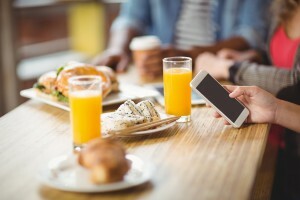 Sales of green tea and other low caffeine, low sugar options have grown year on year, powered by a new generation of younger and health conscious consumers looking for alternatives to caffeinated or carbonated drinks. 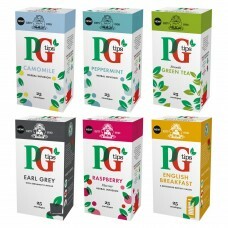 PG Tips variety pack of envelope tea bags contains six different types of tea to suit a variety of tastes in the workplace. The pack contains Earl Grey, English Breakfast, Peppermint, Green Tea, Camomile and Raspberry tea bags and is great for shared work kitchens. Good old fashioned caffeinated tea can retain its place in the brew room though. A study for the Tea Advisory Panel (TAP) has proved that a cuppa can be just as good as a glass of water at keeping your body hydrated. A recommended four cups of tea each day is said to be as good for us as water, without any negative side effects. Sweet treats are always a welcome arrival in any break out area and can help to brighten up the darkest of winter days. 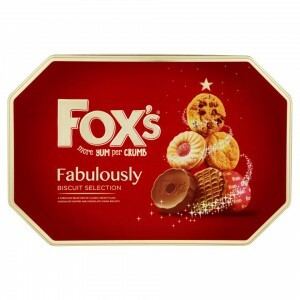 Fox’s Fabulously Biscuit Selection contains a luxury assortment of cream-filled, chocolate covered and chocolate chunk biscuits, ideal for sharing in the office. A 300g box contains Fox’s Crunch Creams, Chocolatey, Chunky Cookies and other favourites to suit everyone. 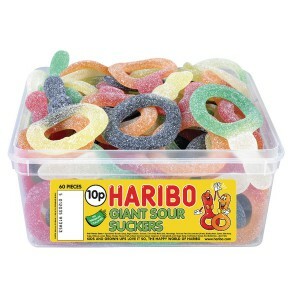 Delicious, soft, sugar coated Haribo Giant Sour Suckers sweets are also now available in the VOW catalogue in a larger pack. The large plastic tub contains approximately 60 fruit flavoured gummy sweets coated in sugar and containing no artificial colours. For more tips and insights subscribe to our newsletter and follow us on Twitter or LinkedIn. Posted 10:25 am by Darren Phillips & filed under Facilities Supplies.